What's Happening ... The sign for the gallery space for Mary Montague Sikes at Crossroads Art Center in Richmond has been updated. The Lucinda Calligraphy letters were created by Banner Express and are like the branding used for her book, Hotels to Remember and also for her latest book, Spirit Visions Soul Songs. LINK for more information on Monti's newest book. Monti continues to work in Cold Wax and oil as well as in Mixed Media and Watercolor on Yupo. She enjoys teaching Cold Wax and other Artist Workshops. The image on the left below was taken during a January 2019 Cold Wax Workshop she taught for Arts Alive! in West Point, Virginia. In November 2018, Monti traveled to Sedona, Arizona where she took a Jan Sitts Mixed Media Workshop at the Sedona Arts Center. See right center image above. She also got to indulge her passion for photographing the exotic scenery of the far West. Image on the right above. On the Edge of Xanadu by Mary Montague Sikes won an Award of Excellence at the Williamsburg Contemporary Art Center’s Regional Juried Art Show in October 2018. This painting, a watercolor/mixed media on canvas, was selected for the 7th Annual Art Speaks Juried Exhibition 2019 by the juror, Janly Jaggard. 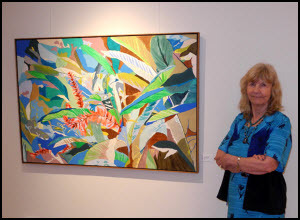 The show will open April 27, 2019 at the Bay School Community Arts Center, Mathews, VA with a reception 4:00 to 6:00 p.m. and will be on view until May 27. Image on the left below. "Point of Entry" by Mary Montague Sikes was selected for the Gloucester Arts on Main Juried Show by Juror Jennifer Morningstar, Gallery Manager of the Charles Taylor Visual Arts Center. This is watercolor and mixed media on 300# Arches paper. Opening reception and awards ceremony will be April 5, 6:00 to 8:00 p.m. at the Gallery. The show will run through April 27. See the image below left center. 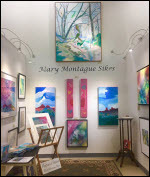 Mary Montague Sikes has recently published a new book -- Spirit Visions Soul Songs-- that features paintings and writings to inspire meditation and focus. Watch our site for book signing opportunities. See image on the right below. LINK for additional information.